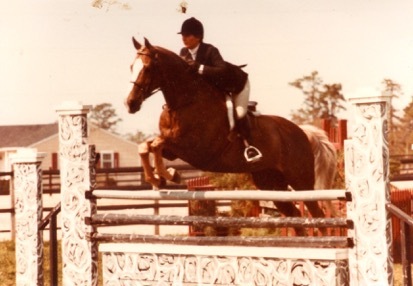 Vicki Lowell began preparing for her new role as US Equestrian’s chief marketing and content officer as a kid when she was bitten by the horse bug. Her destiny was greatly influenced by an off-the-track Thoroughbred, bought by her father to lessen the shock of their move from Oklahoma to Cherry Hill, New Jersey. The horse still triggers powerful emotions when Vicki talks about him. Vicki with her first horse Spats. “This was the day I tried him at the Thoroughbred racing barn. No helmet, which is very bad! I don’t do that anymore,” Vicki said. Vicki wanted to ride with a more advanced trainer and go to shows. “I kept trying to jump higher. Spats wasn’t so sure that was a good idea and had started to stop,” she said. 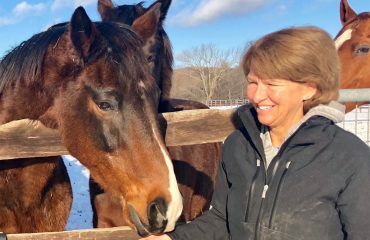 “My trainer didn’t know what to do and I didn’t know what I was doing.” She reached out to Audrey Winzinger of Tustin Farm, who worked with Gary Kunsman at Four Seasons Farm. Vicki’s blessed with a great work ethic and questing, creative mind. 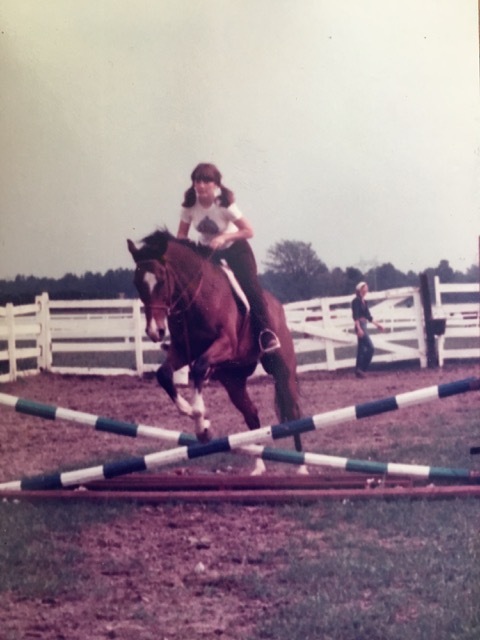 During those horseless years, early in her career, she earned her master’s degree in business administration from Wharton, focusing on marketing and finance. After three years with a consulting firm, she signed on with Proctor & Gambler (1992–2000) where it took her five years to leap up the levels from assistant brand manager to director of marketing for Cover Girl Cosmetics. But business success wasn’t enough. Before leaving for college, Vicki leased and competed Skyhigh. In 2000, Vicki became vice president of marketing and communications for Discovery Health and Fit TV, which put her on course to the pinnacle of her corporate career when she went to work for Discovery Communications in Silver Spring, Maryland. Vicki spent from 2005 to 2015 leading marketing for Animal Planet and other key Discovery networks, which showcased her exceptional talents for marketing, redefining brands and cause marketing, to name only three of her strengths. “Horse Power – Road To The Maclay” debuted the first of six episodes about Big Equitation on February 1, 2006, capturing a unique audience of more than 6 million viewers of all ages. Animal Planet’s production crew filmed at the various prestigious horse shows from summer through fall of 2005, as well as at the barns of the starring riders and their trainers, including Brianne Goutal, ultimate winner of the 2005 Maclay Finals. 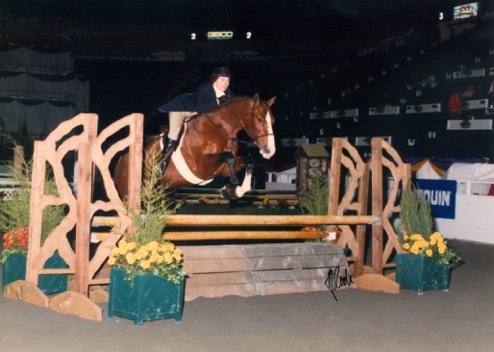 In 2006, “Horse Power – Road to the Maclay” earned Vicki the USEF President’s Award for Overall Excellence. At Discovery and Animal Planet, Vicki made good use of every opportunity. She was known for her leadership, vision and for thinking outside the box. Within the industry, she won both recognition and awards. She was riding and showing, increasingly drawn into that world as more than a competitor. 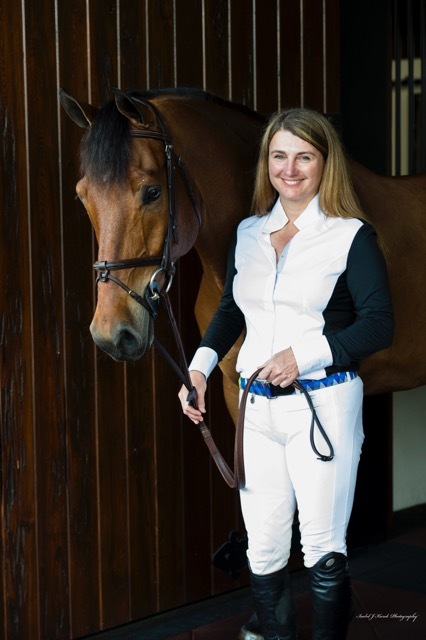 In 2009, she joined the board of the Washington International Horse Show, serving two terms as board secretary, and was elected president in 2013. 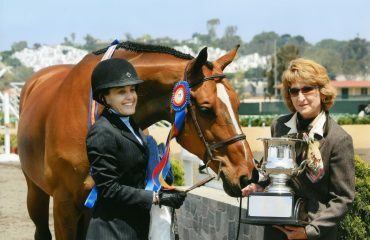 Vicki and Dutch Treat who she rode in her first Washington International Horse Show in the Marshall & Sterling Classic. 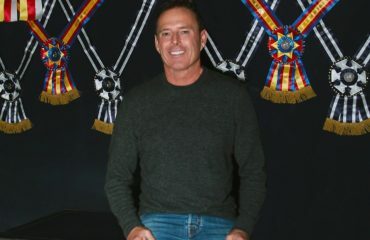 Murray, in the process of retiring from his corporate career, started percolating ideas about the United States’ national governing body of equestrian sport long before he became its official president. Quick clips feature horse crazy kids of all ages having fun communing with their equines and with each other: galloping in a field, splashing in a pond. Olympic footage. Backyard footage. Hugging horse or pony. Mugging for the camera. Caught up in the moment. #JOY. It’s all been a bit of a whirlwind: selling her house in Maryland, buying one in Lexington, Kentucky, moving her horses, new job with US Equestrian. Her jumpers, Tippi Too and Peace, live two miles from the Kentucky Horse Park. Kim Prince is headquartered in Wellington, Florida, so that’s a challenge, but it will all work out in the long run. “It doesn’t really bother me to take this break from showing, because I’m still riding my horses and I’m a part of that world,” said Vicki. “I like being connected to the top of the sport and I like watching the best. I’m learning as I watch. I don’t have to be on my own horse to learn. It’s like the videos in the Learning Center — I love the one about Saddlebreds with Smith Lilly. It’s my favorite production that we’ve done so far. Smith’s an incredible horseman and we asked a lot of tough questions. I want to know as much as possible about every discipline and every sport. Because of her move to Kentucky this year, Vicki didn’t compete at WEF but Kim Prince let her ride Courage De Lux when she was in Florida. 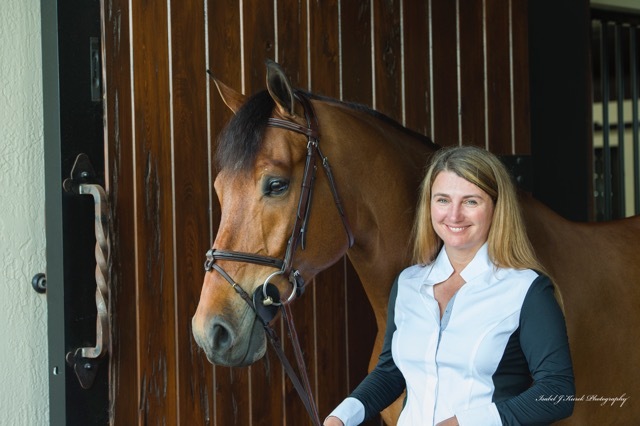 Vicki’s new job at US Equestrian is the culmination of everything else she has done throughout her career. Best of all, she represents every horse-crazy kid because she gets it. Vicki’s one of us.